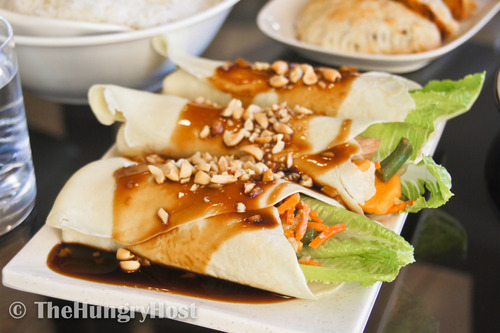 This is one of my favourite Filipino side dishes; it’s our version of a salad roll. 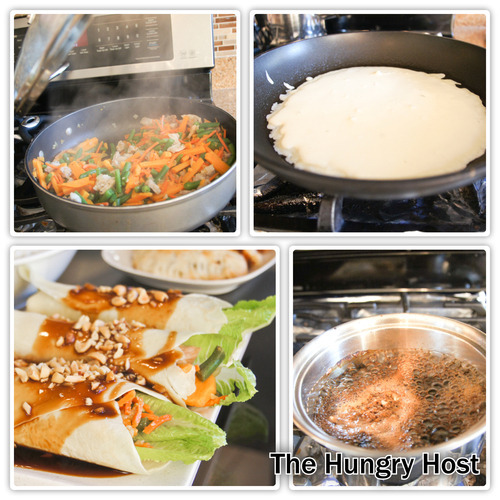 Crisp lettuce, stir-fried vegetables and tender meat are wrapped up in a fresh crepe, and then a salty-sweet sauce is drizzled on top. Top it all off with some chopped, roasted peanuts and you have a delightful snack or appetizer. This is my favourite filling, but you can use just about any combination of vegetables and meat! Begin by making your filling. Stir-fry the onion and garlic in oil over medium heat until soft. Add the pork and cook for a couple of minutes. Add fish sauce and ground pepper to taste. Add the sweet potato and cook for 5 minutes. Add the carrot and green beans and cook until the sweet potato is soft, the pork is cooked through and the carrots and green beans are crisp-tender. Adjust seasoning to taste. While your filling is cooking away, make your sauce. Put the garlic, soy sauce, brown sugar and water in a saucepan. Boil on medium high heat for 5 minutes. Add the cornstarch and water mixture, reduce the heat and cook until thickened. Remove from heat. Whisk all the ingredients for the crepes together. The batter will be thin. Heat a non-stick skillet over medium-low heat. Spray with non-stick spray. Pour about 1/3 cup of the batter in the centre of the pan. Quickly lift the pan and turn in a circular motion to spread the batter in a large, thin circle. Let the crepe cook from the bottom up, until the top is dry. Do not flip the pancake and make sure the heat is low enough so that the bottom of the crepe does not get crispy. You want a soft crepe that is not browned. Cook the crepes one by one – you can layer them between sheets of cling film to keep them warm and prevent them from sticking. When ready, assembly the crepes by laying a large leaf of romaine on a crepe and then topping with the filling. Fold the crepe over the filling (bottom first and then the two sides). Leave the top open. Drizzle with the sauce and sprinkle on the peanuts.